Well, an almost local. I've lived in this ciudad de la furia for eight years now, for most of my adult life. We have a love/hate relationship with each other, the kind most passionate people, uh, I mean cities, can often illicit. Below I've written out all of the information I always give to my friends, and their friends and friends of friends (and on it goes) when they plan to visit Buenos Aires. If you have any questions about planning your own trip, just ask in the comments! I'd love to help anyone enjoy their time in my adopted hometown. Looking for something specific? Jump straight to it. First & Foremost, Forget about "Paris of South America"
First off, I apologize if I'm offending any porteños reading this. But Buenos Aires is absolutely nothing like Paris. It's true that Buenos Aires is far more European than the rest of its neighbors in South America, and the locals take great pride in this. French, Spanish, and mainly Italian immigrants flooded Buenos Aires at the beginning of the 20th Century and there is no denying the impact all of this had on the local culture. However. Big BUT. Buenos Aires is not Paris. And that's not a bad thing! 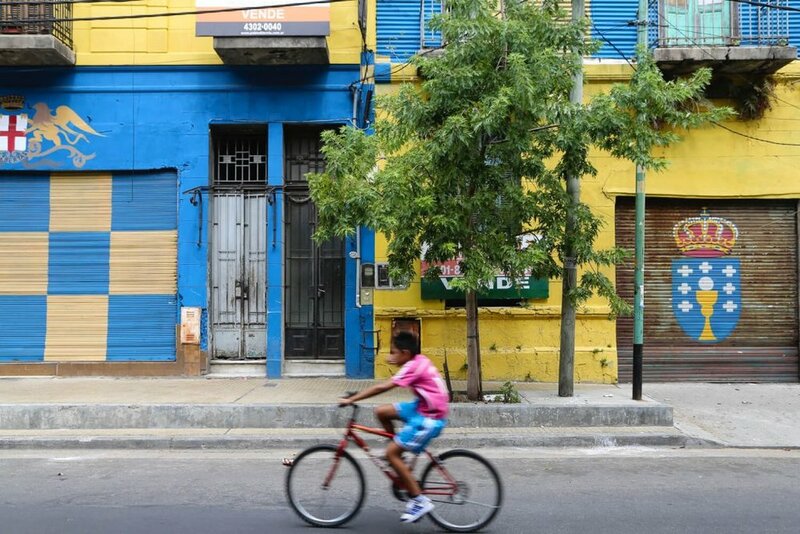 Buenos Aires is vibrant, lively, and also a little grungy. It's a hodgepodge. Right next to a building that would fit right in Paris you'll find a rundown abandoned 1990's office building. This is what I love and hate about this city. But isn't that contradiction in feelings perfect for a city full of contrasts? So my advice to anyone planning a visit to Buenos Aires, let go of any expectations and you'll be open to love Buenos Aires exactly for what it is. Like most of South America, Spanish is the mother tongue here. But unlike most of South America, locals of Buenos Aires speak with a unique accent and vocabulary to the rest of the continent. Castellano Rioplatense, or River Plate Spanish, or even more simply Argentine Spanish, refers to the Spanish spoken around the Rio de la Plata (River Plate) here in Buenos Aires. The "ll" and "y" is pronounced with a "sh" sound. Calle becomes cashe, pollo sounds like posho. Buenos Aires is also home to its own slang, called Lunfardo. If you're interested in Spanish and want to sound like a local check out Che, Boludo, it’s a fantastic resource. Argentina’s international airport is located 22 kilometers outside town but feels much further. If you read something about a reciprocity fee required for citizens of the US, Canada or Australia, FEAR NOT. This has gone by the wayside for all three countries. You won't have to pay any reciprocity fee to enter Argentina. How to get into town from here? Manuel Tienda Leon is a trusty classic. You can get your ticket for their bus from their booth located just after you exit customs. 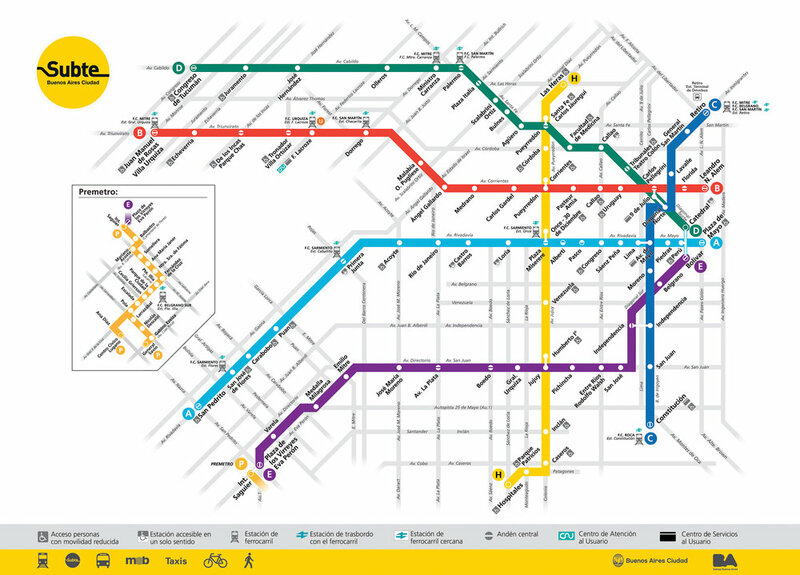 They have two stops: their station in Puerto Madero and the Aeroparque airport. It currently costs $370-450 pesos, to confirm current prices check here. They also offer a Remis service for $1400 pesos if you'd prefer a taxi. Remis: For a taxi, book one of the remis services you'll see just as you leave customs. After customs but before you're out in the public area there's a tiny room with booths offering taxi services. Prices differ on what area of the city you're going to. You can pay with a credit card. What's a Remis? Private town cars. Similar to taxis but always with a set rate, like UBER before UBER existed and without the handy app. Taxi Ezeiza: After you leave customs and pass the remis desks, there is a large desk for Taxi Ezeiza. You can check their prices and even reserve ahead of time here. Prices will be set depending on where you're going, and average around $1140 pesos at the moment. They also accept credit cards. Do not hail a taxi outside the airport. They will charge you whatever they feel you'll pay. It is safest to arrange for a taxi/remis at one of the booths inside. While you can get a taxi or remis at the airport upon arrival, sometimes there are waits if a lot of flights have arrived at the same time. If you want to avoid a wait or just feel more comfortable knowing the set price ahead of time, you can reserve your airport transfer before your trip. You'll have someone waiting for you with your name on a paper like in the movies! Check here to reserve one before your trip. UBER's status in Argentina is unstable. It's technically illegal here but in pure UBER style, it's still operating in Buenos Aires. Taking UBER or one of its competitors is a great option for returning to the airport at the end of your stay. UBER in Buenos Aires is much cheaper than taxis and more comfortable. But don't use these services upon arrival. They're not allowed to pick up passengers from the airports. For more information about UBER in Argentina, scroll down to the section about Buenos Aires public transportation. Aeroparque is the smaller airport reserved mainly for domestic travel. If you're flying into AEP, count yourself lucky. Aeroparque is in Palermo on the Costanera Norte (on the river). Transportation is much cheaper than from Ezeiza, you're already in town! There's an official taxi line out front where you can grab a taxi straight to your hotel/Airbnb. I'd just like to note that the taxis at AEP are a bit of a mafia. I have taken a taxi here on my past three arrivals at Aeroparque (the taxis cost nearly half of the cost of the Remis booths inside the airport) and have had mixed experiences. In September, our driver had rigged his meter so that he could increase the fee when he thought we weren't paying attention. Unfortunately for him, we were paying attention. Last year, a close friend had the taxi drive away with his suitcase in the trunk when he was dropping him off. Of course, for every bad experience, I have had two good ones. I am not trying to scare anyone but just warn you so that you're aware. Avoid any taxi drama and long waits at the Remis booths by arranging to have your own driver waiting for you outside baggage claim. This is what I prefer and will be doing from now on. You can reserve your private Aeroparque transfer here for just $25 US. Like in most places, spring and fall offer the best weather. Spring (mid-September through November) is ideal, and November is the best month to visit Buenos Aires(in my personal opinion). The purple jacaranda flowers begin to bloom throughout the city, lining the streets and parks with tones of lavender. Fall is another great time to visit, with mild weather in March and April. Summer (December-February) is a BEAST in Buenos Aires. It is hot as hades and humid as hell, very similar to Houston in July. Visiting Buenos Aires during the holidays? Christmas Eve Buenos Aires is the big holiday, not the 25th. Argentines get together for family dinners and shoot off fireworks at midnight. Find a terrace to enjoy the show. New Year's Eve may sound tempting, but beware that NYE is a family-centered holiday here, just like Christmas Eve. Don't expect a massive Times Square-style party in the streets. Locals will be counting down the clock with their families. In January the city empties when the locals leave to spend their summer vacations in Mar del Plata, Punta del Este or Miami. Winter (June-August) is dreary in Buenos Aires. While the weather never drops to insufferable lows, it is a wet, humid cold. And what fun is the cold without any Christmas cheer? When you're cold in Europe or NYC, at least you have the contagious holiday cheer to keep you going! But if you can only visit in Winter, fear not, it's not insufferable. The daily schedule in Buenos Aires runs a few hours later than the average American's daily routine. Mornings are sleepy with light breakfasts of pastry, toast, and coffee. Lunch is available from noon until around 3. Dinners are late. Restaurants open at 8 but most don't fill up until around 10 pm. But don't worry if you're hungry early, I go out to eat at 8 pm all the time, ain't no shame in my game. Happy Hours, when offered, are usually between 7-9pm, sometimes starting earlier but not usually ending any later than 9. Boliches (dance clubs/discos) don't start to get wild until after 2 or 3 am. But I have no further tips for that, I'm far past that life stage haha. Tipping is the norm in Buenos Aires, around 10% is acceptable. You can definitely leave more if you feel the service was spectacular, but don't feel like you need to follow US standards. If you're tipping on a credit card, you'll have to ask them to add it to the bill when you give them the card. You cannot add the tip afterward like you can in the US. But only do this if you really don't have the cash on hand. Cash tips are clearly the only way to ensure the server ends up with his or her tip. What's a "cubierto" and why is it on my dinner bill? You also may see a charge called "cubierto" on your bill at the end of a meal. What's cubierto? It's an obnoxious fee that technically should include a glass of water and bread. It's a thing of the past and a lot of new restaurants no longer charge cubierto, (which translates to "cover charge"). But for those that do, most include nothing at all, bread if you're lucky. This does not count as your tip. The cubierto fee goes to the restaurant, not the server. The official Argentine currency is the peso. To check the day's exchange rate click here (with the way it fluctuates I'd prefer not to put any set rate in print). In the not so distant past, there existed a black market to exchange your dollars at a more advantageous rate than you'd receive from a bank. The government had banned currency exchange in what was referred to as the "cepo" (translates to "clamp", I don't think I like that translation haha). The new government has opened up the market and this black market (referred to as the "dolar blue"), no longer exists. You can now exchange your money at any ATM without being ripped off (aside from the ATM fee that is). Do I need to bring pesos with me? Short answer? No, you do not. And even if you want to, you'll be hard pressed to find banks abroad with pesos available to sell to you. You can use a credit card when you arrive at the airport to pay for your taxi into the city. Once in the city, stick to the ATM's or legitimate exchange houses there. Now that I've recommended that you use ATM's, I feel obliged to let you know that ATM fees here can be astronomical. When I use my foreign debit card to take out cash, the ATM charges me the equivalent of $10 US. If you have a bank that refunds your ATM fees, bring it! My Fidelity debit card refunds me these fees immediately. If you don't, take out as much as you can at a time to avoid repeat transactions and multiple fees. You will also hear cries of "cambio cambio cambio cambio" as you walk down Florida street downtown. These people are referred to as arbolitos, or "little trees," in reference to their green "leaves" of dollars. I don't recommend exchanging money with them. It's always possible you'll be slipped a few fake bills (or all fakes). With the exchange rate as it is today, just use an ATM. If you're dead set on exchanging money in Buenos Aires (hey, I don't blame you. That ATM fee is high! ), bring large bills. Exchange houses in Argentine prefer hundreds and will accept fifty dollar bills. Do not bring five, ten or twenty dollar bills, they won't accept them. Also, make sure the bills are impeccable (no tears, marks or writing). It's probably best to get these straight from a bank teller at home before leaving, so they can personally give you the best quality bills. Buenos Aires is a huge, sprawling city, so where you stay can really have a huge impact on your trip. Here's a quick breakdown of the main neighborhoods in Buenos Aires. Stay in one of these neighborhoods if you like to be in the middle of everything and close to main attractions, shops, and restaurants. Palermo Soho & Hollywood are the go-to neighborhoods for most expats and tourists for where to stay and live in Buenos Aires. Soho and Hollywood are two sub-barrios within the enormous umbrella neighborhood that is Palermo. They border each other, separated by Avenida Juan B Justo. They're both full of sidewalk cafes, bars, restaurants of all types and offer the best nightlife in the city. They're hip and beautiful. Enjoy the street art and picturesque streets covered with canopies from the trees lining the streets. Stay here if being close to the best restaurants and nightlife is what you're after. Recoleta is full of beautiful mansions, luxury hotels, and stunning architecture. You may see Barrio Norte also appear as an option. Barrio Norte is technically part of Recoleta but consists more of large apartment towers rather than historic mansions (and it is intersected by commercial Avenida Santa Fe). For that old-school Recoleta vibe, try to find a place near Plaza Francia. Stay here if you booked your ticket with your heart set on seeing the infamous "Paris of the South." San Telmo lies towards the south of downtown, sitting between Plaza de Mayo and La Boca further to the south. This was my first home in Buenos Aires and will always hold a special place in my heart. With cobblestoned streets and historic buildings, it has a certain charm. However, don't come with any illusions of grandeur. Many of these old buildings are crumbling and decaying. However, I think this creates its own sort of unpolished beauty. San Telmo is full of historic cafes, bars, and parillas. San Telmo is also home to one of the best markets in Buenos Aires. It's centrally located to plenty of tourist attractions to make your daily explorations easy. Stay here if you appreciate a bit of history. Try to stay on or near Defensa or Balcarce streets (the streets closest to Avenida 9 de Julio can be less agreeable after dark). Crossing Avenida Paseo Colon from San Telmo, you'll find Buenos Aires' youngest neighborhood. It feels polished and modern, with new luxury apartment towers lining the docks. It can feel a bit isolated from the rest of the city as it isn't very easily connected with public transportation and you can only get in and out via certain streets. Stay here if you prefer things clean and modern. However, I find it a bit sterile. I don't personally recommend staying here but definitely come for a stroll. Villa Crespo borders Palermo, separated by Avenida Cordoba. Despite being home to some great restaurants and bars of its own, Villa Crespo is much quieter than its popular neighbor. The neighborhood is also home to some of the city's best street art, outlet shopping (if that's your thing) and its own futbol team (Atlanta). Stay here if you want to stay within walking distance of Palermo's nightlife but enjoy a more residential feel. Moving northwards past Palermo Hollywood you'll find Colegiales. Colegiales is a residential neighborhood with smaller houses and apartment buildings. It's getting more lively with new restaurants opening up every year but it's still full of young families and cute homes. You'll require taxis or public transportation to get to the heart of things, but it's not far. Stay here if you like to live like a local when you travel. Even further north, after Colegiales, you'll find a behemoth of a neighborhood, Belgrano. Belgrano is enormous, just like Palermo. Avenida Cabildo is its commercial center, full of shops and chain restaurants. Closer towards Libertador Avenue you'll find Chinatown and large apartment buildings near Barrancas de Belgrano. Or stay near Plaza Castelli to experience the posh Belgrano R area, with historic old homes and tree-lined cobblestoned avenues. Subte line D on Cabildo will have you in Palermo, Recoleta or downtown in a flash. If you stay near Plaza Castelli the train at Belgrano R Station will have you in Palermo in 5 minutes or downtown in 20. Stay here if you're looking a quiet, residential feel that's family friendly. While in Belgrano you can live like a quiet, relaxed local, in Almagro you're in the middle of it all. This is a bustling commercial neighborhood and is a more middle-class barrio in comparison to Recoleta's very upper class demographic. To continue the needless Recoleta comparisons, it's also less easy on the eyes. Almagro is grungy and busy. It's not the Paris of the South, it's pure Buenos Aires, you'll love it or you'll hate it. Random fact: Almagro is home to Pope Francis' favorite football team! Stay here if you want to live like a local but not lose the big city hustle and bustle. Where to stay in Buenos Aires: Hotels or Airbnb? Airbnb in very affordable Buenos Aires accommodation. You can get cozy studios or homes big enough for a large family at just $50 a night. Airbnb has really taken off here and there are stunning properties. You can rent a historical home in San Telmo or a high rise with a roof-top pool in Palermo. Whatever suits your fancy, you're sure to find it. If you're more of a hotel person, I'd be wary of the hotels that are on Avenida 9 de Julio or in Microcentro downtown. A lot of hotels are located in this area and while they're nice, and yes, central, I don't find the area to be too beautiful or as safe when the sun sets. I'd instead stay in Palermo, Recoleta or San Telmo. HYATT PALACIO DUHAU | Want to feel like a princess in her palace? This is the place. Palacio Duhau is located on one of the fanciest streets in Recoleta, amidst luxury hotels, mansions and designer boutiques. It's only a few blocks away from the Recoleta Cemetery and Avenida 9 de Julio, making the location priceless. Check rates here. FOUR SEASONS | You know you're always going to receive the best service imaginable in a Four Seasons. It also doesn't hurt that the 4 Seasons is home to two of the best restaurants in Buenos Aires. Order a charcuterie plate and a sirloin in Elena and you'll think you've gone straight to heaven. The hip lobby bar, Pony Line, makes a mean burger and great cocktails. Check rates here. HOME HOTEL | In Palermo Hollywood, Home Hotel is a great small hotel. It has a gorgeous green interior patio, pool and a spa to use a refuge from the city streets. In Hollywood, it's smack in the middle of the city's best restaurants and bars. Check rates here. BE JARDIN BY COPPOLA | Did you know that Francis Ford Coppola owns boutique hotels? His property in Palermo Soho is a beautiful old home, his old home in fact. It's an oasis to escape the city streets, with a beautiful pool and patio (perfect to sip on a glass of Malbec to end the day. Check rates here. HOTEL BABEL | Prefer historic San Telmo? Hotel Babel is a modern and chic boutique hotel in the heart of the colonial, cobblestoned neighborhood. 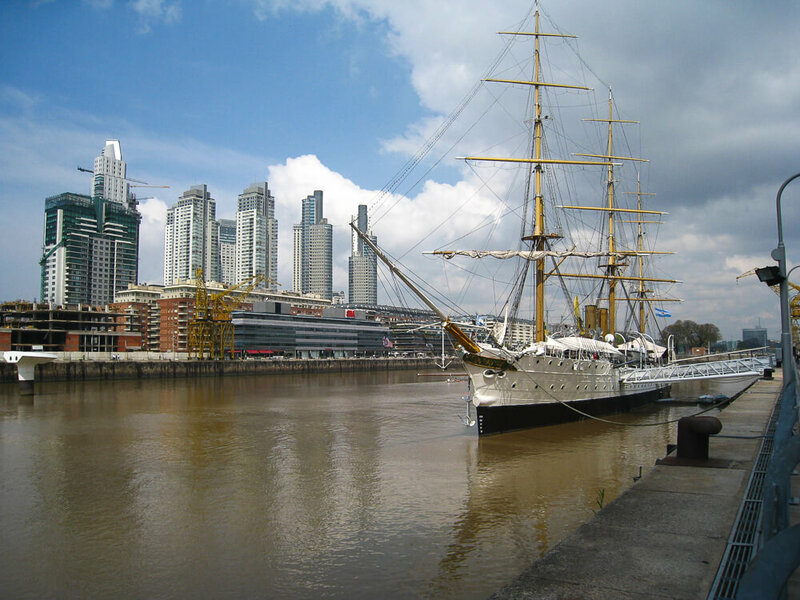 You'll be near the weekly market, La Boca, Plaza de Mayo and Puerto Madero. Check rates here. MILHOUSE HOSTEL AVENUE | A friend of mine stayed in Milhouse and had a great experience. It's on Avenida de Mayo, walking distance to San Telmo, Plaza de Mayo, and 9 de Julio. You have access to the kitchen and grills on the roof to prepare your own food. The rooms have lockers to secure your belongings. There's a common area to socialize and the rooms were comfortable to relax in. Check rates here. ART FACTORY PALERMO | Art Factory is one of the coolest hostels in the city! The walls are covered in murals and graffiti artwork. This hostel really represents the creative side of Buenos Aires. This one is in Palermo, they also have on in San Telmo and one in Soho. Check rates here. The SUBE is the travel card you'll need if you want to take any form of public transportation. Buses don't accept cash, and subway stations no longer sell tickets. If you want a SUBE, check this map here for an official selling point. Under the Provincia drop down, select CABA, and then under Localidad, select your neighborhood of choice. The easiest way to purchase your SUBE card is at Subte ticket windows. They cost 50 pesos each and they will sell you only one per person. Kioskos (convenience stores) that have the SUBE logo in the window also sell them sometimes. Load money onto your SUBE card in kioskos or in the subway stations. You can buy a SUBE card in the Buenos Aires subway stations. The city government has their own answer to Google Maps called "Como Llego." Visit the website here to map out your route, or download the free app from the iTunes store here. It offers public transportation options as well as walking and biking directions. This app is a great resource, I use it over Google Maps 10 times out of 10. 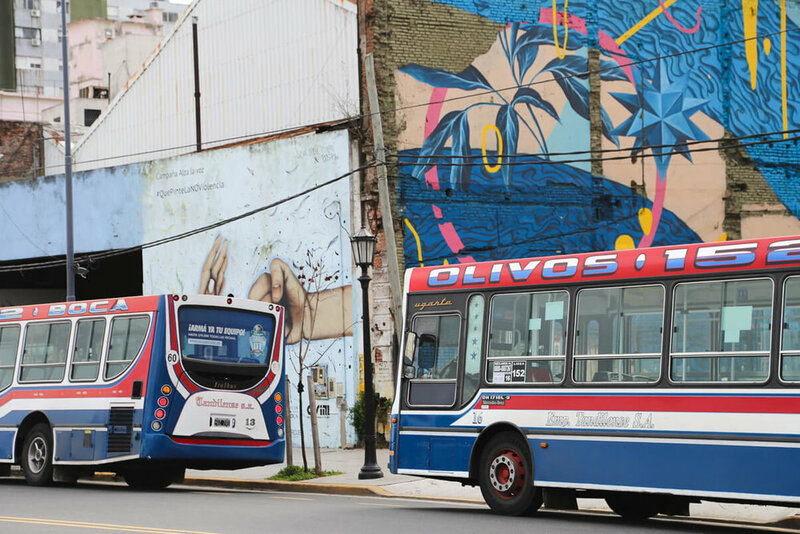 In Buenos Aires, the bus is king. There is absolutely nowhere that a colectivo (bus) won't take you. There are so many it can be very intimidating to try. If you're brave, start with the 152. The 152 line will take you anywhere a tourist could possibly want to go. 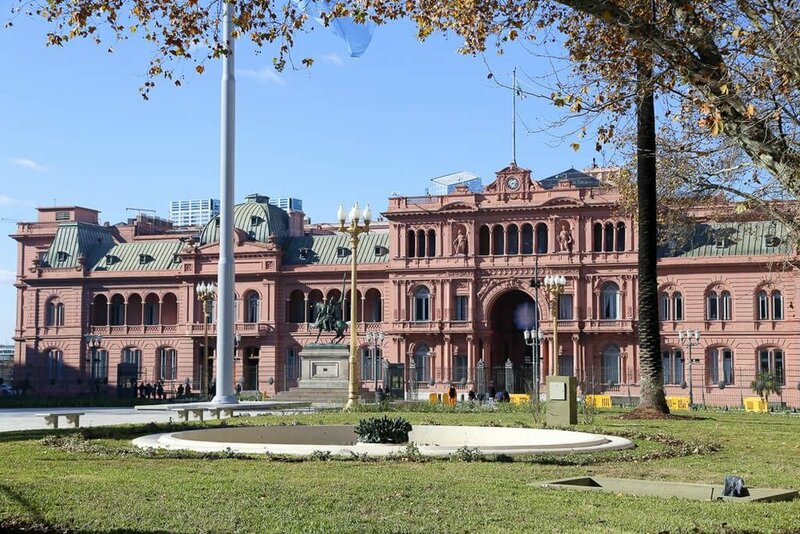 Starting at its terminal in La Boca, it passes through San Telmo, snakes behind the Casa Rosada on it's way to Plaza San Martin in Retiro where it hangs a left up Avenida Santa Fe. It crawls northwards along Santa Fe, crossing 9 de Julio into Recoleta, then into Palermo, and continuing northwards to Belgrano and the northern suburbs. To take the bus, tell the driver where you're going (the price depends on distance traveled), then pay by placing your SUBE card on the little machine. Respect the line, porteños aren't messing around, they respect the order of the line when boarding the bus. The elderly, pregnant women and children have priority to a seat, so don't pretend to not see them unless you want a tongue lashing from everyone on the bus, including the driver. The subte (short for subterraneo, or the underground) lines in Buenos Aires are in the shape of your hand. The lines all originate downtown (or in your palm) and branch out, never to meet again. The government has ramped up construction on the H line (the yellow line above) in recent years, which has made connecting lines a bit easier. See map above. The train station you'll most likely visit is Estacion Mitre in Retiro. There are three lines that leave this station. The Tigre Line takes you to, you guessed it, TIGRE (to visit the river delta). 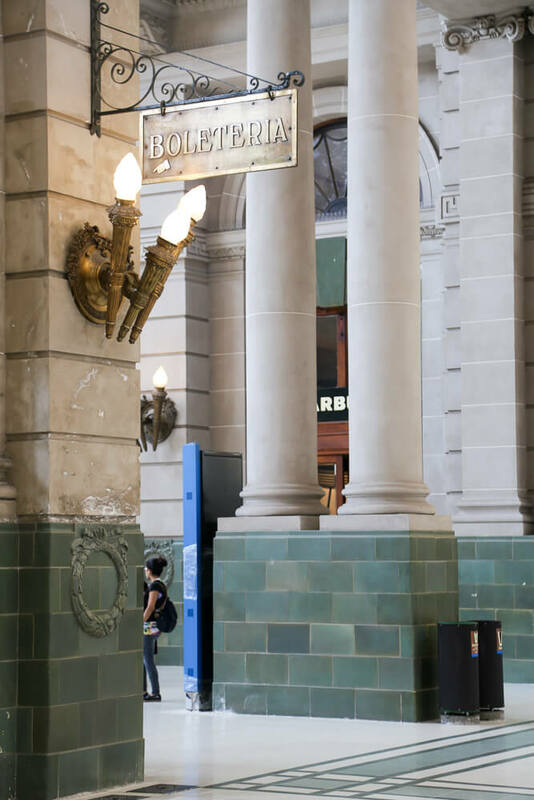 The station has been recently remodeled and is in impeccable condition. It is worth a visit whether or not you plan to take the train. 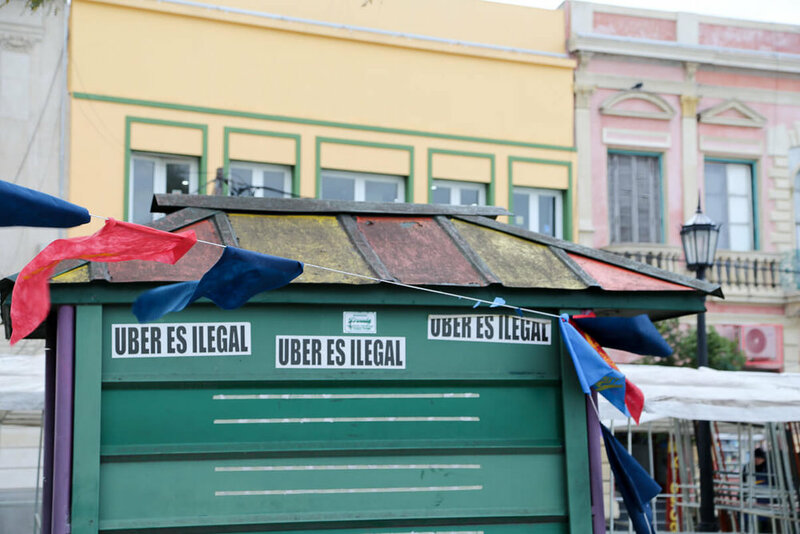 Uber in Buenos Aires is technically an illegal operation. This doesn't keep their driver's off the street, however, and I use UBER all the time here. Why? I've had countless negative interactions with taxi drivers here trying to rip me off and I am tired of it. But that is neither here nor there, should you take UBER in Argentina? Taxis here are still no fan of UBER (are taxi drivers anyway friends with them?). If you take UBER here, then sit in the front seat with the driver. Don't take Uber from the airport where official taxis will retaliate. Also, expect longer wait times (averaging around 10 minutes) and don't be surprised if your drivers repeatedly cancel your trip. They accept cash payments here (because Argentine credit cards won't work in the app). I've been told by one driver that since they prefer cash to credit cards, that he sometimes cancels rides when he sees an obviously foreign-looking name (since foreign tourists, and people like me, tend to always use credit cards). If you want to avoid these hassles, there are a few great (read: legal) alternatives. Download these apps ahead of your trip to make things easier. Cabify is a great option (if you use my code, ERINM7, you’ll receive a credit to use towards your first ride). Cabify is from Spain and internationally recognized, with friendlier business practices than uber. BA Taxi is an UBER-like app made by the city government for the official yellow taxis. You can order a taxi like you would with UBER or Lyft and pay with credit card. You can download their iOS app here or in the Google Play store here. EasyTaxi is another great app for hailing taxis from your phone. Just like you would in any large city, exercise caution. But don't stress, overall Buenos Aires is a safe city. You don't need to worry about violent crimes or kidnappings or anything of the sort. However, you do need to be careful with your belongings as there is a lot of petty theft. Your pockets or purses can be picked on a busy subway so keep your valuables in a closed bag in front of you. The most common occurrence is the motochorro (moto-thief), where someone on a moto will just grab your bag or phone while they speed past you. One thing is certain, if anyone demands your belongings, don't argue with them. Hand it over. An iPhone or a camera is never worth risking your life for. Also, keep in mind that while certain neighborhoods (La Boca for example) have bad reputations, you should be equally aware everywhere you go. Thieves follow the money and that is usually in the nicer neighborhoods. If you're planning your trip and have any questions at all, ask away in the comments! I want everyone who visits to have a great experience so don't hesitate.